The other day the twins came running in the house, breathless. "MOM! MOM! Come see the asteroid in the yard!" Once we started up the hill I had a feeling I knew exactly what the asteroid would be. I had to use the megazoom on my camera to reach it. And then I had to edit the image and zoom in even more so you could see it. It was stuck, way high up in a tree. Lucky, that tree seems to have stopped it in it's tracks. A good thing too. I have a feeling an asteroid like this would really contain some stinging power! Readers, have you seen any asteroids in your yard lately? This is a good time of year to find these bald-faced hornet nests.They normally leave all alone, I found one over a campsite. This is the first yer that asteroids didn't fall on us, we usually have several. I haven't missed them. but make smaller nests than the Asian. Probably be a good idea not to get that one down. Interestingly, I almost never see bees of any type in my yard. Growing up they were everywhere. Kill it with fire! And flaming cans of wasp death! We hates it, we hates it, forever! That is so cute that they thought it was an asteroid! They have very vivid imaginations and probably know more about space than most adults. :-) I hope any hornets stay far away this spring and summer. Empty this time of year. I see them all over the woods when I am out cutting. The guy who does my serious small engine repair work collects them and has em hanging all over the ceiling of his shop. I've never had one of those....thank goodness. That could be really bad. What a cute story! Your boys are adorable! EEEK! Well...it's creepy and cool all at the same time. At least it is high up there so it won't cause any harm these days. Good eyes on the boys who found it! Is that ever cute! I love your kids! No, no asteroids like that. 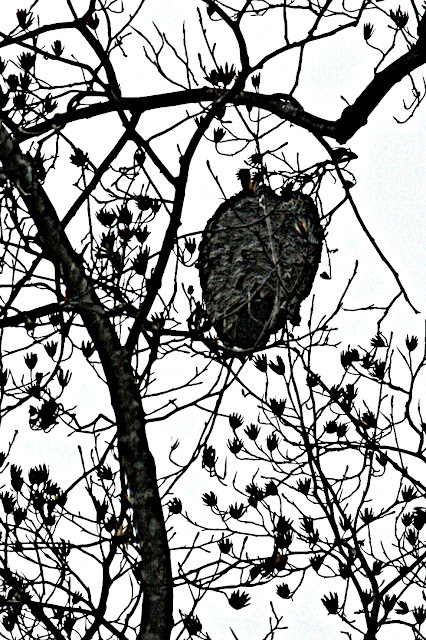 My first year in the woods I cleverly removed one of those nests with a shotgun. It turned out to be a bad plan. The residents were not annihilated by the shot as I had expected them to be. Nice! I love that they call it an asteroid. We have some here, too. Evil alien invaders. Glad they didn't try to knock it down! Growing up, the local fire department came out to my backyard and used special equipment to burn a huge nest. As kids, we found it while playing baseball, and ran to my house to advise my parents. I remember how dangerous that nest was. How funny! However, with that said, keep those asteroids far, far away from us. I just love boys and their imaginations.